Richard Vardaro (for In Music We Trust): When Moon Ska Records went out of business, the ska genre didn't disappear, but as a fan, I thought there was something lacking. With these 9 great new releases, is Megalith Records here to continue where Moon Ska left off? Robert "Bucket" Hingley (of The Toasters, Megalith Records, and Moon Ska founder): Well, yea, but at the same time, I want to separate us from the Moon Ska legacy. Many people have asked me if we were going to be another Moon Ska, I said no, I am actually going to make it a different Megalith. So, I don't really intend to pick up where Moon Ska left off. However, I was really surprised since we had to close Moon Ska (over three plus years ago) that nobody stepped up to the plate to replace it with anything. IMWT: I was surprised as well. Also, since Moon Ska was such a powerful force in the genre, will Megalith Records be a powerful force in the ska genre? Bucket: Well, to some extent, we want to replace what we had with Moon Ska with Megalith -- which will basically be a champion for ska music -- but I think we are going to do things a lot differently and not put it somewhere where it didn't want to go which is what happened with Moon Ska. One of the mistakes we made with Moon Ska, we let it get too big. We relied too much on indie distribution, which is not good, because you end up not getting paid. With Megalith, we plan on having it more retail orientated. We will be more web-driven with mail-order sales and web-store sales using sites like CD Baby and Interpunk to help keep our costs down so we can have an $8 CD album. IMWT: So, you supply them when there is supply needed, instead of sending all this material to a huge retail store and they can end up returning it back. Bucket: You know what the tricks are with these people, they order 50 copies from you one week and return 49 to you the next. With Moon Ska, there were a lot of crappy distributor problems and politics like that, and then compounded with the poor economy at the time, those were two forces that militated against us back then. Also, Moon Ska had gotten too big and too dependent on outside forces. With Megalith, we are going to stay within ourselves and not really have to exist waiting with our hands out begging for our money from distributors who don't pay. IMWT: Even though you answered some of this question, what are the main goals of Megalith Records? Bucket: Basically, I want to put out a catalog of music reflecting great bands from all parts of the world. Also, we are opening up an office in Spain to get some European distribution. This will allow us to introduce the European fans to the American bands and vice versa. There are many great non-American bands like Desorden Publico, who have been rockin' it since the late 80's in Venezuela, who were relatively unknown on the American scene. There are a lot of great bands in Europe, who we tried to introduce some of those with Moon Ska, but I think it will be a lot easier to do with a label like Megalith, because our target is much more going to be the traditional ska and two-tone scene as opposed to ska-punk and variations there after. IMWT: When I began listening to these releases, the first thing I thought of was -- Why these guys? Taking nothing away from the albums that you did release, but I know some of the old Moon Ska bands are still around like Lets go bowling, the Slackers, Hepcat, Pietasters -- why not start Megalith records with them? Was there a reason? Bucket: There were many bands that I felt are doing their own thing now and also, I didn't want to recreate Moon Ska. However, those bands were part of the problem, in the sense that, they got sucked too much into the glory game and we didn't have good business deals with because we got sold out to those people. So, those people I don't think had their mind on what was good for ska music. IMWT: Actually, I had no idea about those sorts of politics -- I was just concerned with the music. Bucket: I am not ruling out doing releases with those bands, but to my mind, those bands were part of the problem. If everybody had stuck together at Moon Ska and basically said we aren't going to run for the money and we are going to keep our thing here, Moon Ska would still be around. We had pumped a lot of promotional money, for example, into a band like the Pietasters, who actually when they went to Epitaph broke the contract with us -- there was a potential lawsuit there that we never capitalized upon mainly because I don't believe in that sort of stuff. IMWT: As a fan of the music, I just never realized when a band like the Pietasters moved labels that there was so much politics behind it. Bucket: Well the politics is all money. Another thing that I found out with Moon Ska that I hope not to recreate with Megalith is that, there is no such thing as a friend in the music business. You know the only saying -- what have you done for me lately -- it is fine to use a label to spend money developing bands, but the minute they can get one cent more from somebody else they are going to stab you in the back and go over there and that is what happened with a lot of the Moon Ska bands. IMWT: When bands left Moon Ska, except for the Slackers for the most part, their music seemed to suffer. The bands didn't put out the same quality of material they did with Moon Ska. Bucket: Well, I think they were bandwagon chasers -- I even read an Alternative Press article and some of these bands were saying that they weren't a ska band. I mean come on. The minute where people start trying to change the style because they think they can make more money, as an artist you are lost. IMWT: Onto the nine new releases, which are very refreshing to hear and I think it is a great step in building the genre back up to where it was. 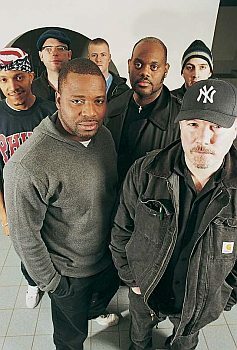 Bucket: What I was trying to do was to mix in some of the old bands and people that I have known for years like New York Ska-Jazz Ensemble, Victor Rice, King Django and the Toasters. These are not people who are in it for the quick buck. These are people who really believe in the music and that is the philosophy behind the new label. These people were here before ska music became all about the money and which was basically what ruin the scene. IMWT: What does Megalith mean? I can look it up in the dictionary and it means an ancient stone that has been standing forever -- but what significance does it have to this label? Bucket: If you look on the cover of the Still Standing compilation that I worked on with Chuck Wren (Jump Up Records), you can see that it is just that -- standing forever. But on the flip side, there's a sense of humor there because Stonehenge and the Megalith is an ancient British relic -- which is kind of like what I am. Just kind of poking fun at myself for that. IMWT: The Europe venture that you were telling me about before, what is going to happen to Moon Ska Europe? Is there going to be a conflict there? Bucket: No, I don't really deal with them. From time to time, I will have some artistic input but I really don't have anything to do with them. However, they will probably help us distribute Megalith titles in England and vice versa. IMWT: Just out of curiosity -- are there any plans of opening a New York City store/office? Bucket: Maybe someday, but right now I just want to have a model where we don't have a massive overhead and just put music in people's hands at an affordable price. You know one of the reasons that major labels are having a problem is the high cost for a CD. For $17.99, you can buy a DVD or video game for sometimes less and get more of an entertainment value. The future of the sales of music is based on people liking bands and they are going to support the band by buying their product instead of burning it so that's why our artistic slogan is "buy it, don't burn it". Support the band by buying their CD because that is the only thing that is going to keep them on the road. At the same token, you have to put the music into the people's hands as cheaply as possible. That is what we plan to do with Megalith. IMWT: Would you ever expand into different genres of music? Punk? Reggae? Bucket: I might, I am into many different styles of music. I know ska the best (obviously) but perhaps we might do something later. I like rockabilly music as well. So maybe we can do something with that, but right now I have my work cut out, creating a new ska label on both sides of the Atlantic. And get it back to the good ole' days. IMWT: I think it is a great idea to try to push the label globally because there is a market out there in Europe, probably more so than the USA. Bucket: There is a lot of market there, for ska music, Europe is a bigger market than the USA. In the USA, the feeling is like -- been there done that -- everybody is a little bit jaded about ska music. In Europe, people are still excited about ska music. It didn't blow up as much over there like it did in the USA. Perhaps only in England, it got a little poppy and commercial, but it Holland, Spain, Italy and France, these countries are really clinging to traditional ska and two-tone ska. There is a great basis of support there and we intend to tap into that. Another thing is, I was having a conversation with an industry wag the other day and he said that there is no way I would be able to do it (be a success again). I said, that's what they told me the first time. I got laughed at every record label in New York City when I was shopping Toasters stuff in 1982. They called it circus music and I would never get anywhere with that. Look what happened, we sold over a million and a half records. Bucket: All of the work, I did in my basement, distributing out of my basement until 1997, when we opened up the first store. IMWT: Due to your previous established success, there is no reason why you cannot do it again especially when you include the Europe venture. Bucket: I have 18 years of experience, nice fat Toasters back catalog and people know when we say we are going to do something, we are going to do it. IMWT: I am really excited for your new label, these releases were great, and your subsequent releases. In Music We Trust and I would like to thank you for your time and we wish you all the luck in the world with the new label, Megalith Records.